I hope you all had a great Christmas and are looking forward to the new year. I had a good Christmas and definitely hope next year is good. My Mum’s birthday was on the 20th of December and as it’s so close to Christmas I nearly forgot all about it. We decided to buy her an apron for her birthday, as she had mentioned she couldn’t find hers, and then she would get the rest of her presents on Christmas day. This is the card that I made her. Paper – Cosmo Crickets DeLovely. Stamp – Amy R Best Birthday wishes. 3 in 1 butterfly punch and Doily Lace punch. 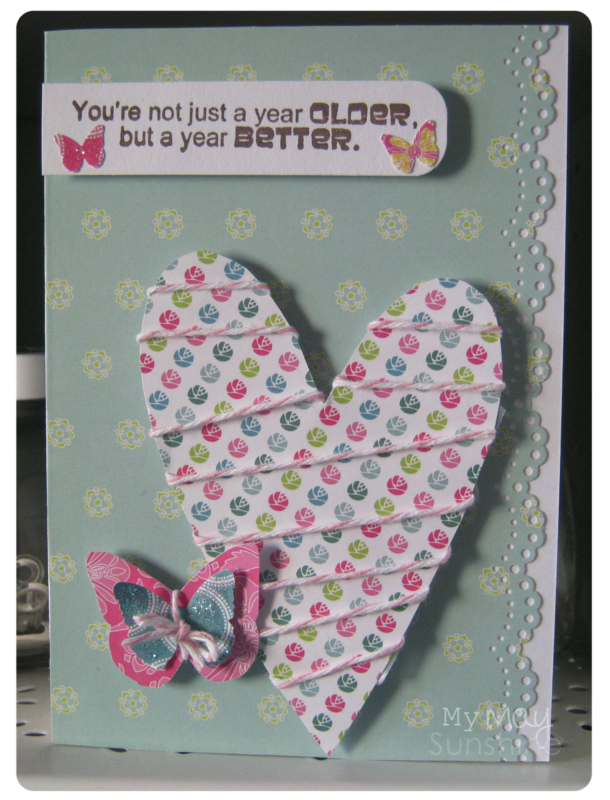 Heart and large butterfly – templates. Twine – The Ribbon Reel.